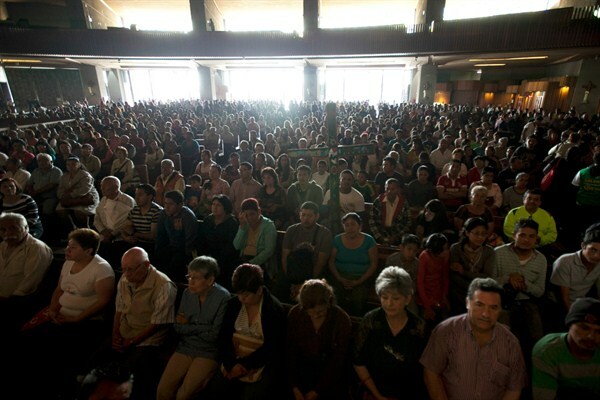 Central American migrants attend a Mass at the Basilica de Guadalupe, Mexico City, April 18, 2015 (AP photo by Marco Ugarte). TAPACHULA, Mexico—David Gramajo was working as a bricklayer in Atlanta in 2012 when he was stopped by police for driving without a license, turned over to immigration authorities, and deported to his native Guatemala. But once he returned to Guatemala City, he and his wife Alejandra struggled to maintain their business and protect their three children. They received constant threats from gang members who extorted and threatened their family for the little money they had. Eventually, they were forced to leave behind their business and again head north, but this time with a different aim: Mexico.